The new Yamaha P45 88-key weighted action digital piano is the newest member of the Yamaha P Series pianos. It has a contemporary design with a small footprint that allows for easy portability and storage. 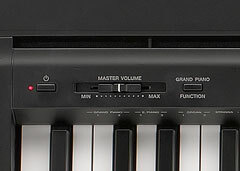 The Yamaha P-45 digital piano replaces the current model, P35. It features Yamaha's AWM (Advanced Wave Memory) sampling, which uses digital technology to record an instrument's sound. AWM Stereo Sampling creates a deeper, richer and more spacious sound by using pairs of waveforms captured with two microphones. The P-45 is the most affordable model in the new P-series range with a compact and portable design which makes it perfect for use on the road and in the home. The 88-key Graded Hammer Standard keyboard with matte finish black keys ensures superb playability. There are 10 stereo sampled voices with 64-note polyphony (max) and reverb/preset chorus effects. In Dual mode, two voices can be combined for further versatility. The Duo function enables the keyboard to be split into two identical zones, allowing the student to follow and copy the teacher's hands easily, perfect for tuition sessions. There's easy tuning and transpose functions, perfect for accompanying singers and other instruments, and a USB-to-host port for connecting to computers and iOS devices. AWM (Advanced Wave Memory) sampling uses digital technology to record an acoustic instrument's sound. AWM Stereo Sampling creates a deeper, richer and more spacious sound by using pairs of waveforms (L and R) captured with two microphones. Just as on a traditional acoustic piano, the keys of the lower notes have a heavier feel while the higher ones are lighter to the touch. Together with the matt-finish black keys, the P-45 feels as good to play as it sounds. 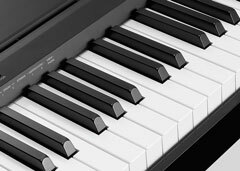 Like other P-series digital pianos, the P-45 has a slim, contemporary and compact design. This allows for both easier storage and portability in a wide range of applications. Operating the P-45 is beautifully simple. For example, the "Grand Piano" button is easy to locate on the front panel and instantly restores the P-45 to the best acoustic piano voice. 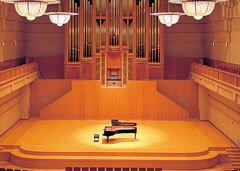 Do you want to compare the features of this stage piano to other portable digital pianos? Visit www.digitalpianobuyersguide.co.uk for more advice.